Ko Nang Yuan might be just a tiny group of tropical islands, but as diminutive as they may be, they are arguably some of the most breathtaking in Thailand. Together they make up three enchanting close-knit enclaves, thanks to a long sandbank (formed as the tide retreats) of super soft white sand that joins all three islets. Collectively, they are most famous for their diving hot spots which offer you such great snorkelling opportunities and their wonderful beach scenery. They are mostly known as the north, middle and south island respectively. The only transport to the island is by boat of which you have two options unless you choose to hire your own private cruiser and crew to take you there. One option is by longboat from Ko Tao. They run back and forth three times a day with each one- way trip costing 100 Baht. The trip takes twenty minutes. If you're just going for a round trip to the island and not actually getting off the boat, you won't be required to pay for the return trip. If you want to go for a one-day snorkelling trip from Ko Tao, prices start at 250 Baht which includes the round trip boat fare. To get there from Ko Tao, take a boat from the Lomprayah Pier, which you'll find south of the main pier in the village of Mae Hat. Another way to go is with the Lomprayah Catamaran from Ko Samui at a cost of 550 Baht each way. These high-speed luxury boats take just under two hours to Ko Nang Yuan. They are safe, air-conditioned and far more comfortable. Please note that you will be required to pay a 100 Baht fee on arrival, however, this would be waived should you decide to stay overnight on the island. It's also possible to go by boat from Ko Phangan as well as from Surat Thani on the Thai mainland. Take special notice that you'll not be allowed on this island with items such as tin cans and plastic bottles as they have rules here to help protect the environment. You may or may not have noticed that water and other drinks sold on Ko Tao come in glass bottles, which effectively means that liquid refreshments must be bought at the restaurant on the island, albeit at inflated prices. Apparently not that long ago, (well, maybe twenty years or so) Ko Nang Yuan had been just another undisturbed and secluded island. Simple huts with no electricity were the order of the day. Freshwater had to be brought in from neighbouring Ko Tao. If you wanted to wash, (there were no showers then) you could purchase a bucket of water for a few Baht and then douse yourself down. That's all changed as tourism has turned that all around. These islands are known for their superb coral reef so snorkeling and scuba diving is a must. If you like, you can even take scuba diving lessons here. If you are lucky enough, you may just spot a black-tipped reef shark or a turtle. The giant stone boulders on the beach are sculptured by water and wind over many years. The wind can get very strong during the monsoon season and waves are known to lap these shores. Perhaps not the best time to visit. 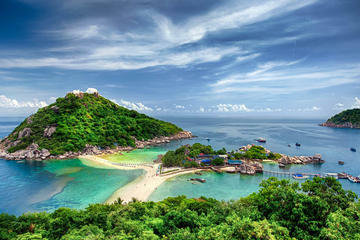 How would you like to join a full-day trip to Koh Nang Yuan and Koh Tao from Koh Samui by speedboat? You'll get to enjoy a day away from the hustle and bustle of the busy city and snorkel in the crystal clear waters. You'll find a tonne of tropical marine life and beautiful coral reefs in these breathtaking islands. A buffet lunch and round-trip transfer are included in this package. Don't forget to bring your camera and sunscreen before embarking to the speedboat for this amazing snorkelling trip. All the snorkelling equipment is also included. You'll find all the details for this trip in the link above. Have fun. As far as being a day-tripper on the island, you can relax on the beach, swim and snorkel in the translucent emerald green waters, have a drink and a bite to eat at the one and only bar and restaurant on the island, walk up to a majestic 360 degrees viewpoint or just explore the wonderland. All in one day by foot. There are no roads here either, which means no cars, bikes, buses or pollution. That is of course apart from gases emanating from those thundering six-cylinder tractor engines attached to the longboats. Don't you just love that sound? Incidentally, if you decide to have something to eat at the only restaurant, be prepared to pay for it. I mean really pay for it. The restaurant belongs to the Nangyuan Island Dive Resort establishment, so food and drink prices are at least three to four times higher than at Ko Tao. The owners and staff are fully aware that they have a total monopoly and therefore take full advantage. If you're an overnight guest, this is an entirely different entity as lunch is slightly cheaper, but don't take my word for it, get a second opinion. As a day visitor and short on funds, it's best to return from whence you came and have lunch there. If you do decide to stay I believe that the barbeque fish is the preferred choice, though there is a selection of both Thai and Western food. If you're short on time and are on a single day trip, you may want to consider visiting Ko Nang Yuan after lunch in the afternoon as the morning day-trippers tend to cause the islands to become a little congested. However, if you want to stay awhile for the diving activities, you will not be disappointed. There are a number of dive sites with assorted hard and soft corals sporting an abundance of fish in and around the island. Best of all, most of these sites are suitable for almost anyone. Snorkelling is another great activity. Firstly, there is Nang Yuan Pinnacle, a granite peak with boulder swim-throughs featuring morays and reef sharks. Then there's Green Rock classified as a maze of boulder swim-throughs, caves and canyons with similar fish and shark species. A third dive site is the double rock formation aptly named Twins, which are covered in corals and sponges and set amidst a colourful coral garden backdrop. Last but certainly not least are the Japanese Gardens which derived their name from the hundreds of hard and soft coral formations found around here. This site is particularly safe for beginners and most popular for anyone wanting to do a bit of snorkelling. For the more experienced diver, there are a number of excellent dive sites between Ko Nang Yuan and Ko Tao. The north island is a tree-clad rocky outcrop whose shallow reef makes it ideal for snorkelling. There's little in the way of beach except for a bit of sandbank linking the island to the other two. Perched on stilts and partly hidden among all the rocks and trees are a few wooden bungalows which form part of the Nangyuan Island Dive Resort. This particular island resort establishment also has its accommodation spread over all three of the islands here. The middle island is the smallest of the three retreats, parts of which are strewn with large recessed boulders. Small as it may be, some of the beaches here offer shade in the form of palm groves. The water is deep enough for swimming and snorkelling. Part of the reef stretches down towards a horseshoe inlet sprinkled with boulders and plenty of coarse sand. It also features hard and soft coral. Just so you know, should you wish to take in the spectacular views from the south island's highest point, it will take you approximately 30 minutes to reach. Simply follow the signposts to the viewpoint which you'll see are dotted along the way. Once at the top, you'll be richly rewarded with fantastic views. And did I mention that this could be an excellent opportunity for your romantic overtures, but that, I'll leave wholly up to you? Now would be the time to take those selfies and any other photos.